Lhasa, the capital of Tibet Autonomous Region, located on the north bank of Lhasa River with a history more than 1300 years. It is the political, economic, cultural and religious center of Tibet. Lhasa in Tibetan means “the holy place”, or “the land of gods”. As early as seventh century after the emperor Songtsen Gampo unified the whole of Tibet, he moved his capital from Yarlong to Lhasa and founded Tubo Kingdom. It was said that Lhasa was only a wasteland full of grass when princes Wencheng reached Tibet from Xi’an. Later, the famous Jokhang temple was built. Pilgrims from all over Tibet visit this precious sight, many hotels and residences were built around Jokhang temple, then the embryo of the old township of Lhasa was formed. The red hill that the Potala Palace rides and probably the site of the earliest settlement at Lhasa was built by emperor Songtsen Gampo, construction work of temple’s and palaces have been done during that period of time. Therefore Lhasa, the famous city on the highland came into existence. Lhasa was peacefully liberated in 1951. There are 7 counties and 1 district under the municipality, the Total City area covers 29539 square km and urban area covers 523 square km. Today, Lhasa is a town of over 400,000 inhabitants. Among them nearly 130,000 are city residents. There are 31 nationalities in Lhasa, Tibetans accounts for 87 percent. Lhasa stands at 3650 meters above sea level. It is one in the highest cities in the world, Lhasa River runs through the city from east to west, also the physical feature of Lhasa stands from east to west. The climate of Lhasa is semi arid and monsoon. It has 3000 hours of sunshine per year; it is praised as Sunshine City. The annual rainfall varies from 200 mm to 510 mm, mainly from June to September. The highest temperature of Lhasa is 28’C, while lowest is -14’C, during winter temperature falls down to zero degree Celsius mainly because of the thin air, it is dry and windy in winter and spring, Lhasa has 100 to 120 frost free days a year. Lhasa, now a days has its own modern industries, namely, electric power station, mining, machinery repairing, food processing, textile, building material, printing, arts and crafts and many other small and large scale industries. The national handicraft productions are carpets, which are famous domestic production in both national and international markets, which are popularly welcomed by many countries. Tents, waist knife, wooden bowl, Gold and silver ornaments etc. with unique feature are also well received by various people. There are more than 1000 shopping place in Lhasa and the goods are abundant, programmed and computerized telephone is quite popular. Also mobile telephone payer, IDD, photographic fax have also been introduced, with the existence of this communication facility, it has become very convenient to connect with the other parts of the world. The science research institute, education centers, sports, culture, medical care, maternal and child hygiene, banks, libraries, parks, etc. All kinds of public facilities are completed. The famous such as Qinghai- Tibet, Sichuan-Tibet, and China-Nepal, motor able roads are passing Lhasa, making it the transport hub, there are dozens of hotels and guesthouses and more than 20 travel agencies. 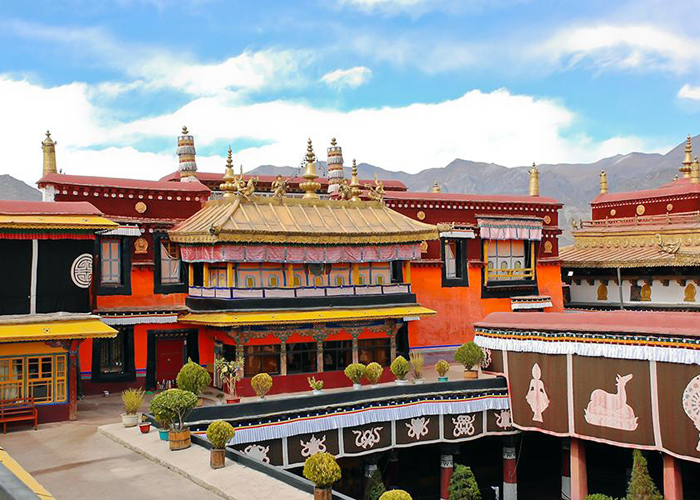 Which have high standard of reception capacity with having best needed service facilities and strong nationality feature apart from famous sightseeing such as Potala Palace, the central Jokhang Temple, Drepung monastery, sera monastery, Dragon King Pool Park, there are nearly 80 small monasteries and historic centers in city. Soon after Chinese government adopted the new policy of reform and opening to the outside world, travelers from many countries started to pour into Lhasa. Now the tourist industry is booming and anticipated a glorious future. Lhasa has been a remote dream for many travelers who have yearned to see its old culture, mysterious religion, magnificent scenery and peculiar folklore with their own eyes. Recently city municipality has opened some more tourist attraction sights, namely, Tibetan traditional arts and crafts gallery, museum, picnic spots and parks. Lhasa, with its natural and special highland beauty, is always waiting and welcoming more travelers and friends. Inhabitants were in existence in Tibet since the latter part of the Paleolithic Age, which is considered as the opening curtain of the Tibetan history. By the Neolithic Age these inhabitants had scattered to a wider range of circle whose result had gradually led to the Tibetan race of the present generation. Administration which was recognized by the Qing central administration. The Central Administration of China, the Qing Dynasty, gave the over lordship of Tibet to the 5th Dalai Lama and established its representative in Lhasa called the “Amban” to supervise political affairs of Tibet in order to strengthen its control over Tibet. After 1911 Revolution the Republic of China established a working office in Lhasa to exercise its management over Tibet. In May 1951 concerning the method of liberation of Tibet, the 17 – Point Agreement, was signed between the Central People’s Government of China and the Local Government of Tibet that opened a new historical page over Tibet. Buddhism, with as history of some 1,300 years since its penetration into Tibet, has shaped a unique from “Lamaism”. Tibetan history, culture and religion are mixed together and in filtrate on every aspect of social life. Tibetan religious arts have a distinctive style with adoption of Indian and Chinese Buddhist influence, thus forming itself a pearl of oriental Buddhist art in Chinese Buddhism. Tibetan architecture is rich in shapes, sumptuous and full of noble aspiration. The Potala Palace is built on the top of a hill and penetrates its dome into the sky. It’s the King of Tibetan architectural structures, carvings, murals, “thangkas” and skilled butter sculptures, and a vast accumulation of historical monuments which from a kind of religious art which is developed into a School of Tradition. People living on the Tibetan plateau, such as Tibetans, Monpas, Lhopas and Moslems, have their own ways of living, marriage, burial or other ceremonies. Tibetans call themselves “Bodpas”. They have a total population of 3.4 million among which 2.2 million are in the Autonomous Region. Tibetans mainly engage in agriculture, husbandry and handicrafts. Tsampa mainly (barley flour), beef, mutton, butter tea and barley beer are the main food and drinks. As for clothing, Tibetans wear cloaks made of woolen fabrics or lambskin. They love ornaments and women wear striped aprons. Nomads and people living in remote areas depend on their transportation on Yaks, Donkeys, Horses and Yakskin boats. Their marriage system mainly consists of monogamy. Tibetans don’t have surnames. Their names consist of four or two syllables chiefly adopting meaning from Buddhist ideas. Festivals in Tibet are in variety among which the grandest is the Tibetan New Year, followed by others such as’ Wangkor” festival and horse races. For the dead, sky burial, water burial, cremation and stupa burial are in practice, but the sky burial is the most popular of them all. 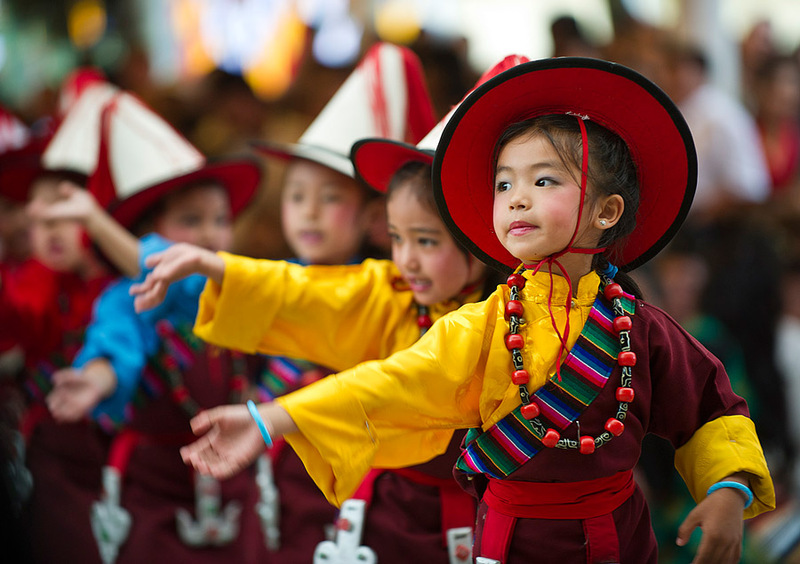 Along with the development of Tibetan history, Tibetans have created a unique science and culture of their own, which are important formations of the whole Chinese culture. The voluminous and magnificent historical documents, and cultural relics, humanist and folk literature presently in existence are the fruit of labor and wisdom of the Tibetans, also a treasure of the ancient Chinese civilization. Great volumes of scriptures such as “Kagyur” (translation of Commandments),” Tengyur” (Translation of Commentaries) “Four Tibetan Medical Tantras”, “The Happy Feast of Sages” “Biography of Bhuton” and “Biography of Milarepa” have been translated into many languages. Situated five-km distance to the western suburb of Lhasa at the foot of Mt. Ganpoi Uze. 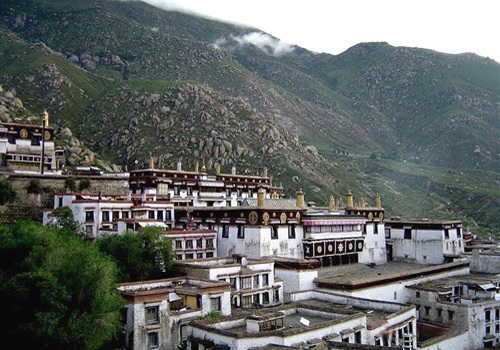 Jamyang Choje, a disciple of Tsongkapa, founded Drepung Monastery in 1416 and the founder of Gelugpa Sect. The monastery, occupying an area of 250,000 square meters with a fixed number of 7,700 monks, is the largest monastery keeps plentiful historical relics, Buddhist scriptures, arts and crafts. Maitreya ia a main relics of the Drepung Monastery. It is a Buddha of future, which is said that only seeing it would release one’s suffering. Situated in Lhasa, Jokhang Temple was built on mid of 7th century AD and later extended by successive rulers, it has now become a gigantic architectural complex. It is a four storeyed temple with splendid golden roofs. It has architectural feature of Tang Dynasty and also assimilated very much features from both Nepalese and Indian Buddhist temples. The murals in the temple mainly depict the life stories of historic characters. The temple houses many historical relics since Tang Dynasty and statues of King Songtsen Gampo, Princess Wencheng, Princess Bhrikuti Devi, “Princess Willow” (a tree), and “The Uncle – Nephew Alliance Tablet” can be seen at the front gate of the temple. 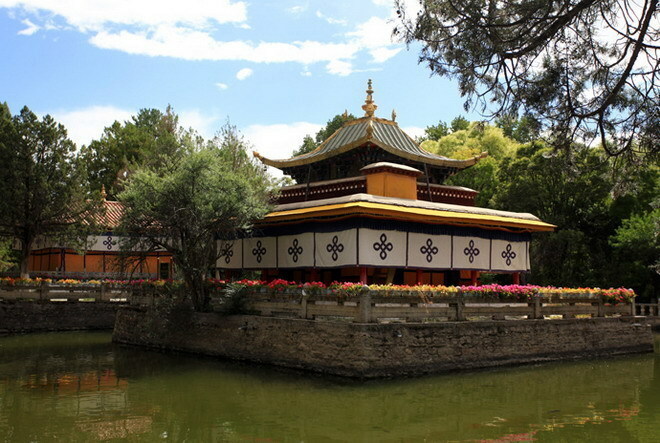 Norbulinka means “the jeweled garden”, was the site of the successive Dalai Lamas summer Palace. The garden cover as area of 360,000 square meters. The whole garden consists of two main parts – Norbulinkha at the eastern area and Jianseling Palace at the western area. Gesang Palace, Jianse Palace and Daktanmiju Palace are the main building in Norbulinkha. There are pine trees, cypress and some other trees as well as many different kinds of flowers. Some precious animals, like bear, are also raised in this garden. Norbulinkha has been classified as National preserved until relic and garden. The Potala, one of the most famous architectural works of our nation, is erected on top of the Red Hill in Lhasa. The word “Potala” comes from Sanskrit. In the 7th century, after the Tibetan King Songtsen Gampo’s marriage with Princess Wenchen of the Tang Court, the Palace was built for meditation in the mid-17th century. It was rebuilt by the 5th Dalai Lama to its present size, and ever since it became the Winter Palace of the Dalai Lamas. The construction took fifty years from its beginning to completion. The Potala is divided into two sections, namely, the Red Palace and the White Palace. 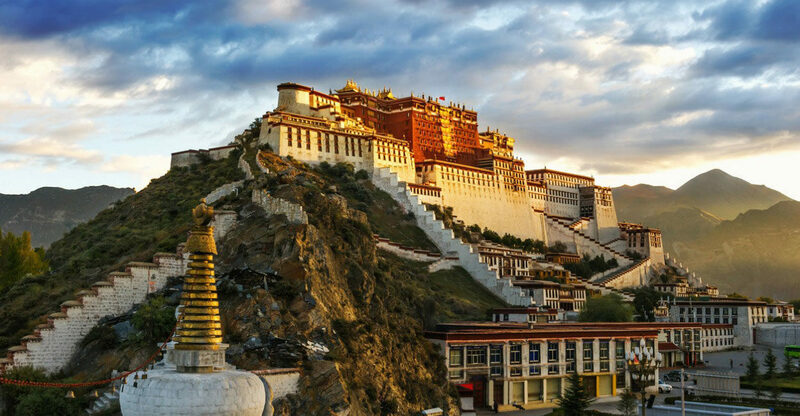 The total height of the Potala is 117 meters which is built in thirteen storeys, the length of the Palace from east to west has 400 meters and the breadth from south to north has 350 meters. The whole building is a structure of stone and timber. The topmost flat glistens with golden roofs. It is a majestic architectural work and the cream of Tibetan culture and a complex of Tibetan and Han culture. You must be in position of a valid passport. We will obtain your visa for Tibet and require the following information when making your reservation. Full name as it appears in your passport, passport number, date of expire, place of issue, nationality, date of birth and occupation, two passport size photographs are also required. Addition, you must allow a minimum of one-week working day in Kathmandu for the visa to be physically stamped in your passport. And booking should reach us at least 30 days prior to tour departure date and More Than Mountain will process for visa. The climate can be extreme varying from 25c in the day time to 5c to 10c. At night winds blow at a speed of 60-80kms per hour and at times more. The best time to travel May to end of June and again during the month of September on the above program. Temperatures are pleasant at day and night (from 25degree to below 0 degree centigrade). Advice to wear warm clothes. Beside these normal clothes, the following items are recommended, down jackets, down paints gloves, well worm in walking shoes, sun hat, a raincoat or a folding umbrella, woolen socks and sweater and a light jacket with hoot. We recommend that you insure yourself against sickness, accident hospitalization, cancellation etc., as we do not accept all responsibility for damages of expenses, which may rises from mishaps to persons to their belongings during these pilgrimages.